The First Battle of Galveston was a naval engagement fought on October 4, 1862 near the city of Galveston, Texas between forces from the Union Navy and the Confederate States of America. The U.S. Navy began a blockade of Galveston Harbor in July 1861, but the town remained in Confederate hands for the next 14 months. 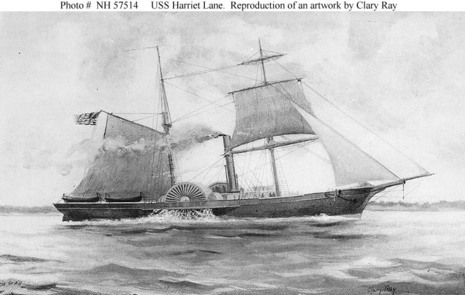 At 6:00 am on October 4, 1862, Commander William B. Renshaw, commanding the blockading ships in the Galveston Bay area, sent the USS Harriet Lane into the harbor, flying a flag of truce. The intention was to inform the military authorities in Galveston that if the town did not surrender, the U.S. Navy ships would attack; a one-hour reply would be demanded. Two Rebel guns from another location opened on the Union ships. The boat that Colonel Cook had dispatched now approached the Union vessels and two Confederate officers boarded U.S.S. Westfield. Renshaw demanded an unconditional surrender of Galveston or he would begin shelling. Cook refused Renshaw's terms, and conveyed to Renshaw that upon him rested the responsibility of destroying the town and killing women, children, and immigrants.